In response to the devastating hurricanes that have affected the Southern United States, Puerto Rico, and many other areas of the Caribbean this season, we have been getting a lot of questions about preparing for natural disasters with propane powered generators. According to Matthew Stein, who authored When Disaster Strikes, a guidebook for emergency planning, “Everyone should have at least one small, backup generator on hand to provide power for short-term emergencies and power outages.” This is important for both your safety and your comfort. Having a propane powered generator ready to go when disaster strikes will ensure you are able to keep your refrigerator running so that your food does not go to waste. It will also keep you and your family comfortable, by powering your air conditioning or heating system, as well as lights during the evening hours. A propane powered generator can even be used to power a television or computer during short-term power outages, which is important for getting news updates and important safety alerts from local authorities. When it comes to choosing a propane powered generator for your home, it is important to consider your location, budget, and what you want to use your generator for in the case of a power outage. There are two main types of generators, which include permanent and portable options. Depending on your specific needs, the type of generator that will work best for your home will vary. Permanent propane powered generators are permanently installed outside of a residence and are typically powered by either propane or natural gas. As a permanent fixture of your home, this type of generator is wired into your existing electrical system, including a transfer switch that monitors incoming electricity. When a power outage occurs, the transfer switch will automatically disconnect your home from the utility line, connecting to a separate power line from your generator. Thanks to this wiring, when your electricity does go out, you will have your power restored within a matter of seconds. A permanent generator will not only instantly take over in the case of a power outage, it will also have the power needed to keep your entire home running as it normally would. The main drawback of permanent generators is that they can be quite expensive and additionally require professional installation. However, if you live in an area that has frequent power outages and plan to regularly rely on your generator to power your home, a permanent generator is an excellent option. Permanent generators are also a worthwhile investment for those that live in climates that experience consistent cold and ice during the winter, as they can easily keep your furnace and hot water heater running in even the harshest conditions. If you live in an area that has consistent power and does not suffer from harsh winters, a portable generator may be a better option for your home. Portable generators are ideal for providing power to essential appliances during short term power outages caused by inclement weather. These generators are not wired to your home, and therefore must be connected to the appliances that you want to power by using extension cords. Portable propane powered generators are an affordable option that will keep you and your family safe and comfortable during an emergency, without requiring the investment of a permanent generator. Depending on the model that you opt for, a portable generator should be able to power your fridge, some lighting, and a computer or television. They will not, however, be able to keep larger utilities such as heating or cooling systems or hot water heaters running. 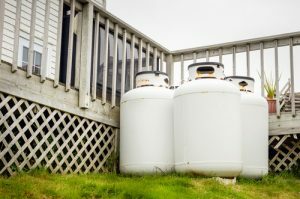 If you are planning to purchase or have recently purchased a propane powered generator, and are in need of a propane supplier in Indiana, Illinois, Kentucky, or Tennessee, Lin Gas is here to help. Contact us today to learn more. Our hearts go out to all who have been affected by the recent hurricanes in the Southern United States and the Caribbean.